Ever since I first stepped into a Kia for the first time I’ve become very fond of them. I love the great technology features and I love the exterior styling. 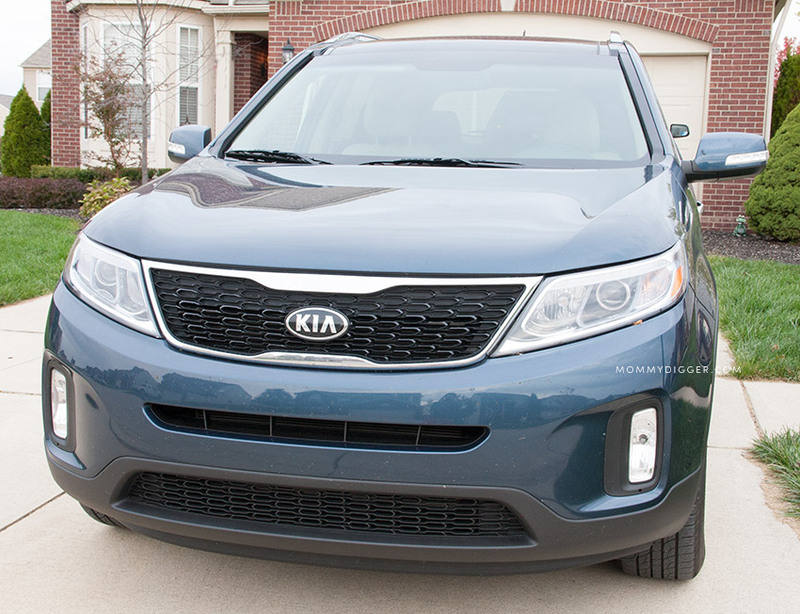 On our road trip I got to test out the Kia I’ve been dying to try, the 2014 Kia Sorento! I had heard so many great things about this little SUV and was excited to try it out with my family and see how it stacked up for myself on our 18 hour road trip. We had LOTS of time to spend as a family really putting this family crossover SUV to the test. The Kia Sorento offers a lot of room for a smaller SUV. There is plenty of room for larger car seats like ours and room to spare so the back passengers have room to spread out and get comfortable. When your going on a week long vacation with a 3 year old and an 8 month old there will be tons of luggage. The Kia Sorento packed in all of our luggage with ease. There is even a nifty hidden storage area to pack even more of your stuff into. This was an absolute necessity on our trip. We made many stops that took us off the beaten path and the navigation was always there to easily get us back on route. It was also very helpful in helping us find a hotel to stay the night and catch a few z’s and break up the long drive. If there was a traffic backup the Sirius Traffic would alert us and ask us if we wanted to avoid the backup and take us on an alternate route, this was very handy! This is one of the coolest features in my opinion. I HATE blind spots, they make me incredbly nervous. The Kia Sorento has a blind spot detector built into the mirror so that if you are getting ready to change lanes and there is another car or object in the way the light comes on, if you turn your signal with a car in the blind spot it will alert you with a beeping sound. Super neat and such a great safety feature. This was so nice to have. Right in the windows there are sunshades. Perfect for kids and babies. I’ve had the aftermarket sunshades but they never stay on and are a pain to roll up and down. In the Kia Sorento I could easily pull them up and down during our long trip. When the Kia Sorento is in reverse the backup camera shows up to help guide you out. This is a must have feature for me on any car. I love being able to see what is behind me, I’m only 5′ 1″ so there is only so much I can see by simply turning my body and looking back. Other cool notable features are the push-button start, the electrical outlet and the power liftgate. This was a great car and I was sad to see it go. I seriously will consider looking at buying one once my lease is up on my current van. It’s packed with features, it handles great and the drive was nice and smooth. if your looking for a new vehicle I would highly recommend test driving a 2014 Kia Sorento. You can purchase one starting at just $24,100. Find a dealer near you to test-drive one today. I drove a 2014 Kia Sorento for a week to facilitate my review. All thoughts and opinions are my own. I need a new car badly – this one looks great. I specially like the dashboard with the built in GPS and the roominess inside and big trunk. Perhaps Santa will reward me for being good! The navigation system looks amazing! I’d love to have that in my vehicle. I love how spacious the back trunk area can be! What a lovely vehicle! I love the rear backup camera and the blind spot detection…..